We offer free 3 Dimensional (3D) view of your cards and tuck box before you order with us. Create Your Own Custom Playing Cards With Us . Custom playing cards are introduced as a cheapest and an affordable advertising medium for your products and services. You can use these customized cards for promotion of your brand. For this purpose you can customize both face cards and back cards. You can add your products, company logo and other company details on these custom made playing cards. With the use of customized playing cards you can present your ideas and messages to others by giving them memorable gift which will they enjoy for longer periods and will always remeber you each time they play your custom made cards. You can also create personalized photo playing cards of your loved ones with using their photos for occasions like birthday, wedding, mother's day, father's day and many more. We are leading manufacturer of high-quality customized and personalized playing cards for over 40 years. All your cards are printed on state of the art Heidelberg printing machines. We manufacture custom playing cards not only for game makers but also for magicians also. 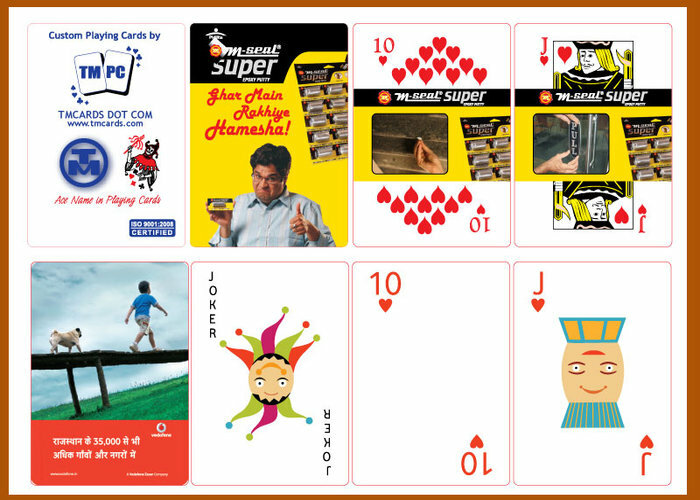 Magicians, game developers and game makers are always looking for customized playing card manufacturer. Copyright © 2017-18 TMCARDS DOT COM. All rights reserved.